The sandy beach stretches the banks at the Pinware River mouth along the Labrador Coastal Drive in Southern Labrador. Off in the distance, the Pinware River mouth in Southern Labrador is barely visible but in the foreground, there is no fog and the sandy beach adorns the shores. 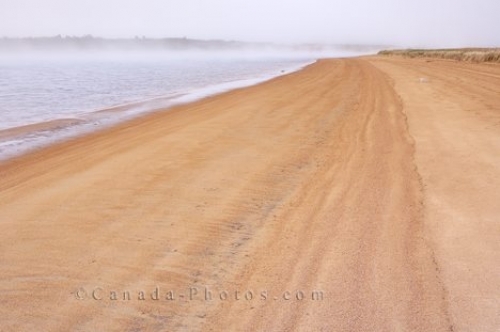 A beautiful place to wander the beach while watching the fog turn the river into a mystical picture. Pinware River mouth shrouded in fog at the Pinware River Provincial Park along the Labrador Coastal Drive, Highway 510, Viking Trail, Trails to the Vikings, Strait of Belle Isle, Southern Labrador, Labrador, Canada. Picture of the fog over the Pinware River Mouth in Southern Labrador with the sandy beach clearly visible in the foreground.